Here's an essay about TRUST from my friend, Charity Vanderhoof, and how she followed God's lead when she and her husband were forced to sell their house. Thank you for sharing, Charity. I have many stories of trust, especially from a season of my life when my husband, Vic, was having violent seizures and unable to work. We went from being a family with a good financial situation to being destitute rather quickly. During that time, we were forced to sell our house and downsize. My husband was no longer able to help in decision-making because of the amount of brain damage from his seizures, but I knew we had to sell the house because we could no longer afford it. I talked to the bank and made it personal to them. I told them I would put it on the market if they would bear with me and not foreclose. They agreed to work with me. The housing bubble had just burst and things were not in our favor, but I had been praying. I knew the Lord was telling me to sell the house and He "spoke" a number to me for what to sell the house for. After interviewing realtors, all of them thought my price was too high and that we would have to make a short sale. Then, one realtor gave me a number $2000 above the number the Lord had spoken to me. We obviously went with that realtor. It all happened fast from there. The FOR SALE sign went up in the yard. Then, that same afternoon the original person who had the house built was in the area because he was relocating back to the area and hoped to find a house in his former subdivision. Imagine his surprise when he saw the house he had originally built was for sale. He came to check it out, then he made an offer that night. He offered full asking price for the house in a market that was a sellers market, not a buyers market. We accepted, of course. Then upon appraisal, the appraiser said the asking price was $2000 higher than the appraisal value. So, the price went down to the appraisal price, which was exactly the number the Lord had spoken to me when I was praying about what to do. The sale closed on the house 2 days before the bank's deadline. Only God could have orchestrated the whole thing. Through this event, and many more like it, I have started to learn that, while I might not always have the best emotions about what happens in my life, God is there all the time. 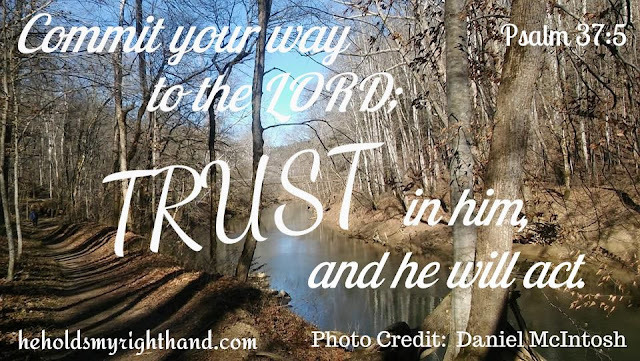 I am learning I can trust him with everything. I am learning to say, "Okay God, this is yours to take care of. I am going to do my best to follow your lead and then lean back and let you work."